The software industry’s ability to easily create new products that are compatible with existing ones hangs on the outcome of a closely watched federal court case. The U.S. Court of Appeals for the Federal Circuit will weigh whether copying bits of code from Oracle America Corp.'s Java programming language by Alphabet Inc.'s Google was a fair use under copyright law, or whether it infringed Oracle’s copyright to the tune of $9 billion. Fair use allows limited copying from protected works that would otherwise be infringing. Following a Dec. 7 oral argument, a ruling is likely in the first half of 2018. The case pits software developers’ ability to make products that work together against creators’ rights to control how their software is used. The decision will impact companies beyond the two tech giants. It may affect the speed and variety of technological products available to consumers, businesses, and developers ( Oracle Am., Inc. v. Google, Inc., Fed. Cir., No. 17-1118, argument scheduled 12/7/17 ). “Anything you buy has software. And if it gets more expensive to make software, prices go up, features will go down,” Joshua Bloch, a computer science professor at Carnegie Mellon University, Pittsburgh, told Bloomberg Law. Google argues that if Oracle wins, competing developers who want their products to work in any computer environment may either have to spend more to get permission to use bits of protected software or be limited in which markets they can enter. Consumers would face higher prices and less competition—and may ultimately have to choose among silos of compatible product lines, it said. Oracle, for its part, has argued that software creators should be able to control new uses of their copyrighted works, including in new markets or environments. Some software creators—particularly small ones—are worried that a Google win on the fair use question would empower large companies to poach new markets before copyright holders can enter them. Whichever way the Federal Circuit rules, the case is likely to end up at the doorstep of the U.S. Supreme Court, where it would face uncertain prospects. Google says its copying of some of the Java code was a standard software industry practice, in which application program interfaces, or APIs, can be freely copied. APIs are bits of code that are shorthand for larger chunks of frequently re-used code. Reimplementation of APIs allows companies to make software and devices that work together, such as the way almost any manufacturer’s keyboard or mouse can be plugged into most computers. Knowing that the commercial success of a computer depends on having a wide variety of software that can be used on it, Google copied the Java APIs to make it easier for programmers who already knew Java to develop apps for Android devices, Google argues. The strategy paid off. Android is now the most successful mobile operating system in the world, running on 70 percent of smartphones. 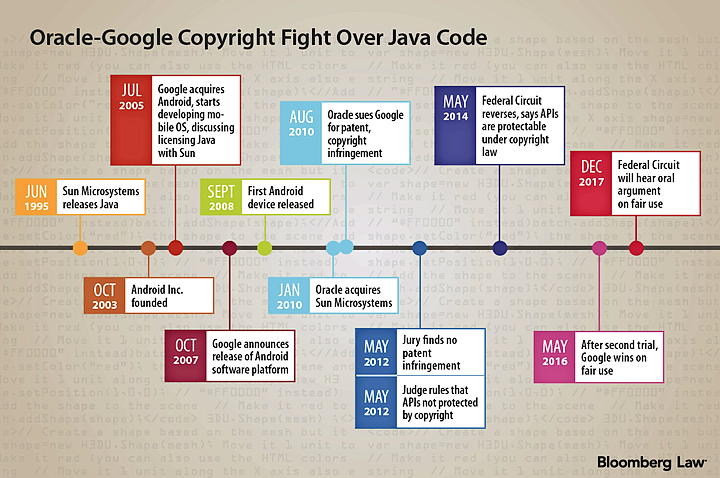 Oracle says it deserves a multibillion-dollar damages award because Google infringed its Java copyright when it copied the code. Software developers supporting Google’s position fear that an Oracle win will throw their industry into turmoil. “We are in a scary place, because for the last I-don’t-know-how-many years of computing, the concept has been that the reimplementation of APIs is a good thing for everybody,” software developer Geir Magnusson Jr., chief technology officer and co-founder of Sourcepoint Technologies Inc., told Bloomberg Law. An Oracle win could encourage more use of open source tools, Bloch said. But adoption of open source will take time while standards are rewritten, because many existing open sources standards were created with the assumption that APIs can be reimplemented. However the appeals court rules, one or both sides are likely to seek Supreme Court review. There’s no guarantee the high court would take the case, especially because there is no split among federal appeals courts on the issues. That leaves the matter open to a certain level of gaming in litigation. It’s not clear that a different federal appeals court would have ruled that APIs are protected by copyright law, as the Federal Circuit did the first time it ruled in 2014. That makes appealing to the Federal Circuit important for those who don’t want to risk having a different appeals court decide that APIs aren’t copyright-protected. The Federal Circuit, however, ordinarily can’t exercise jurisdiction over copyright cases. But because Oracle’s original complaint against Google included patent issues, Oracle was able to appeal to the Federal Circuit, instead of to the U.S. Court of Appeals for the Ninth Circuit, even after the patent issues were no longer part of the case. That gives plaintiffs who want to make sure a case goes to the Federal Circuit an incentive to incorporate some kind of patent issue. Doing so could prevent the emergence of a circuit split. “People might say it’s almost malpractice not to tack on a patent claim so your appeal can go to the Federal Circuit,” Pamela Samuelson, a copyright law professor at the University of California and co-director of the Berkeley Center for Law and Technology, said. If the Federal Circuit doesn’t affirm, at a minimum, that what Google did is fair use, software developers will have ongoing uncertainty over what is allowed, Jeffrey T. Pearlman, a lecturer at Stanford Law School and co-author of a brief supporting Google that was filed with the Federal Circuit by Bloch and 75 more computer scientists, told Bloomberg Law.